Home / AroundTheWorld / Lucid Dreaming? Could a startup could edge its way into direct competition with Tesla? As reported in Business Insider this week, Lucid Motors is a startup company that is seeking to compete directly with Tesla, which is actually staffed by former Tesla engineers. 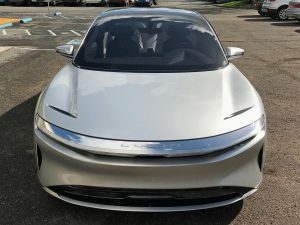 Peter Rawlinson, who was the chief engineer of Tesla’s Model S, and Eric Bach, Tesla’s former director of engineering are both now working on Lucid Motors’ first car. The Lucid Air prototype is a 1,000 horsepower, luxury, electric car that will cost over $100,000. The main difference between Tesla models and Lucid models is that the, “batteries, which have been refined over 10 years, make the Lucid Air more tolerant to repeated, fast-charging than other electric vehicles” as reported by Rawlinson. The company wants to compete with Tesla in the Chinese market, primarily because Tesla didn’t see much financial success there. The relationship between business and government guides Lucid Motors’ motives. With China’s recent pledges to reduce carbon emissions, regulations will begin to encourage more efficient electric cars. Therefore, Lucid Motors see this as an opportunity to reach out to affluent Chinese consumers who are looking for a luxury electric car. Will there be a disruption?